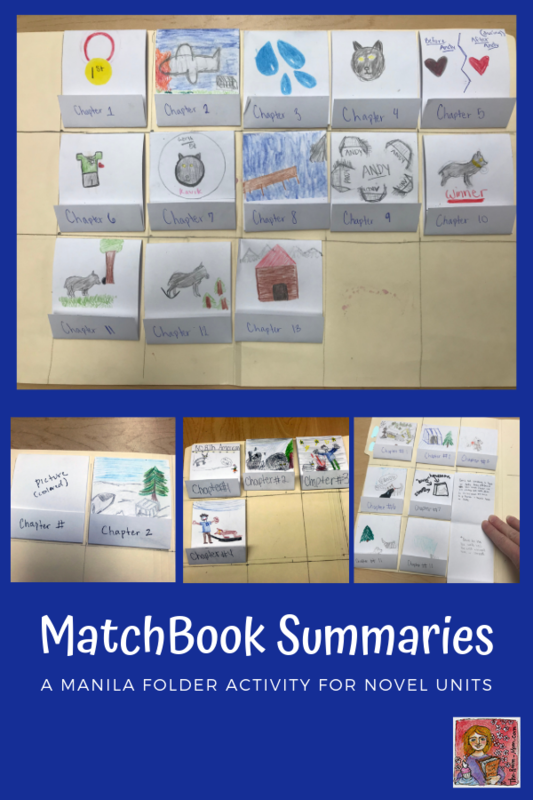 As a culminating activity for our latest novel study, my students created MatchBook Summaries. 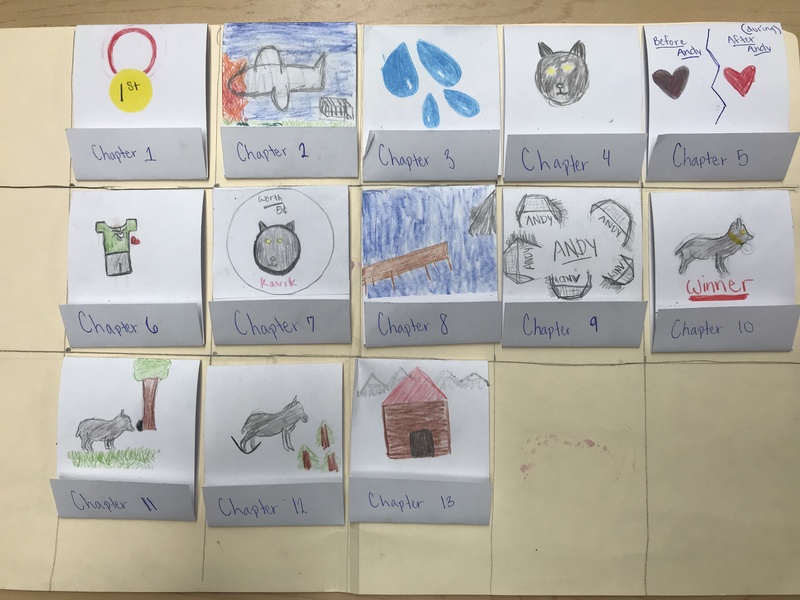 For each chapter in the book, students wrote a summary about key events in the chapter, provided a related quote, and designed a matching illustration. The writing and drawings were displayed on cardstock paper strips that were folded like a matchbook. The MatchBook Summaries were attached inside a manila folder to provide an outline or overview of the whole novel. The project has been a great way to practice writing thorough explanations about story details and locating specific quotes that provide text evidence to support student responses. 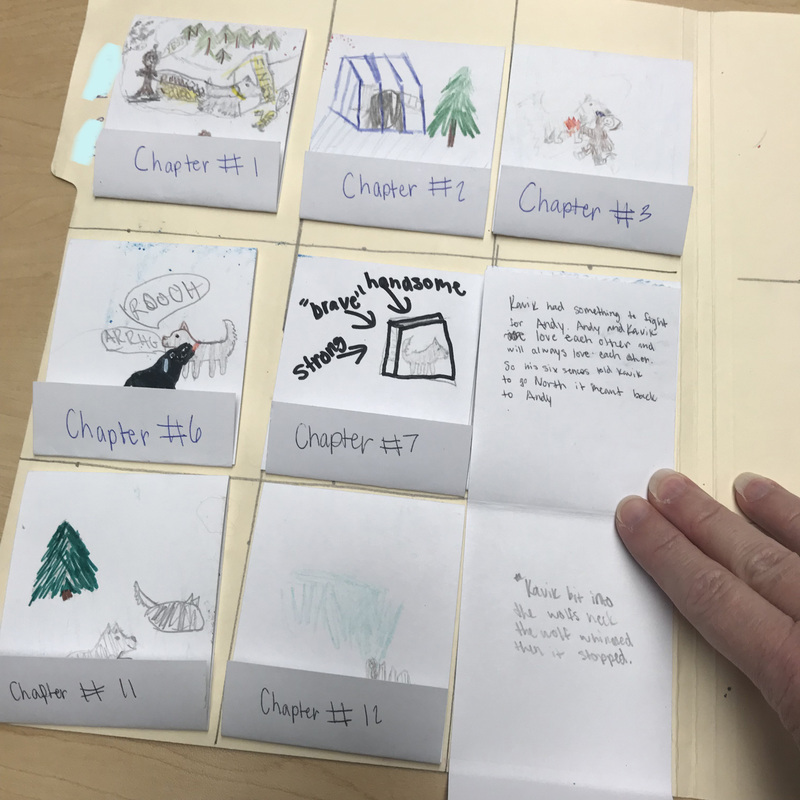 Each student will need cardstock strips for each chapter of the novel you are using. For our novel, Kavik the Wolf Dog, the book had 13 chapters. I have 27 students. 27 x 13 = a lot of cutting, so prep your materials ahead of time for this writing activity! Cut the cardstock into strips that are 7 1/2″ x 2 3/4″. I have THIS PAPER CUTTER that has grooves for paper scoring. You use a tool that looks like a dull knife and press lines into the paper strips. The score lines make the students matchbooks fold perfectly every time. I made the grooves on the paper strips at 1″ from one end and 3 1/4″ from the other end. Have students create grid lines in light pencil on the interior of their manila folders. 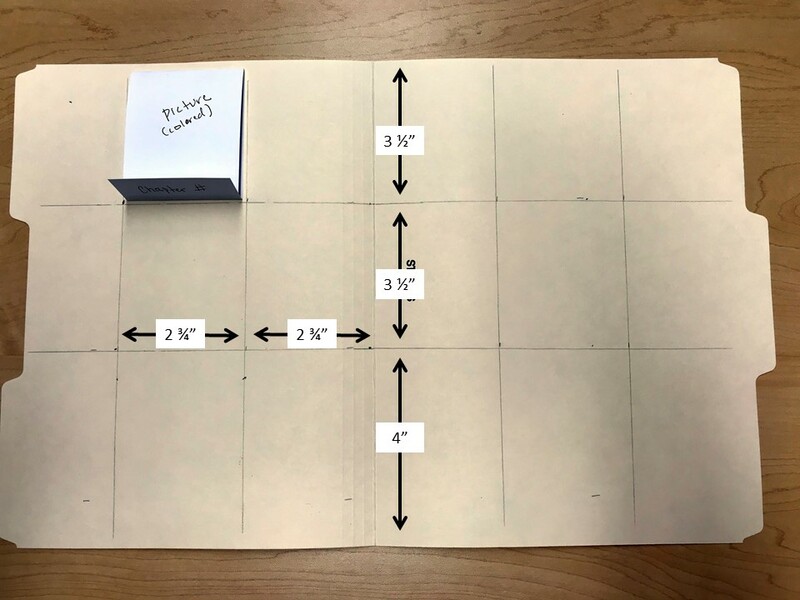 Many will make mistakes while they measure, so I model where to measure and draw lines as they measure at their work space. 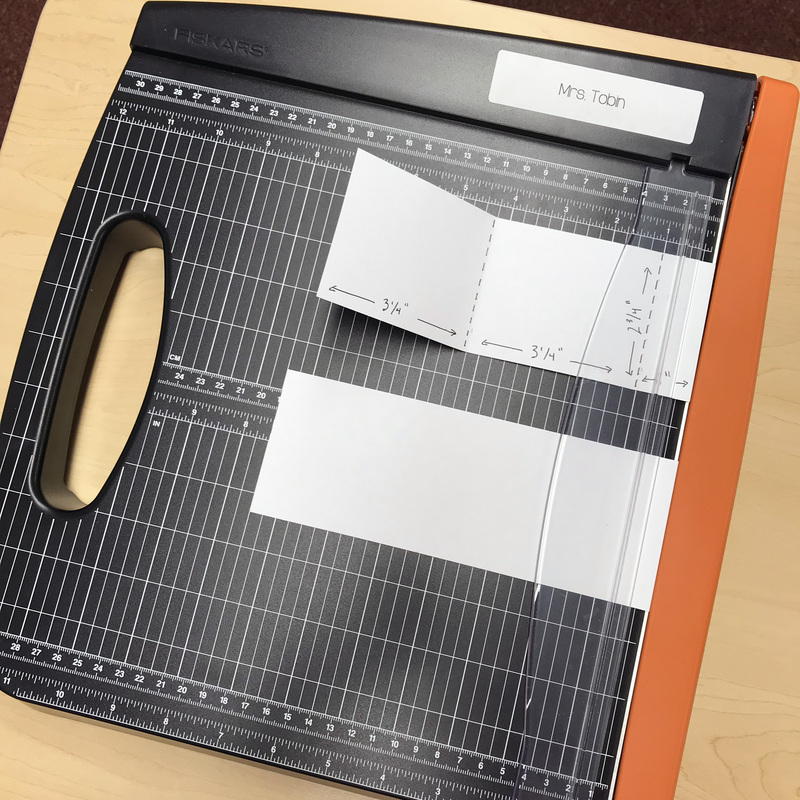 Because the folders are wide, I have students mark 2-3 dots across the folder at the spot where we need lines and then the ruler lines up against the dots to draw a straight line. It took some time for the students to create the grid, but it was great measurement practice. After students have pencil guidelines in the manila folders for their MatchBook cards, they begin creating the chapter summary matchbooks. The folded cards have the chapter name or number on the outside of the small flap at the bottom. The outside top has a simple illustration that relates to the chapter. 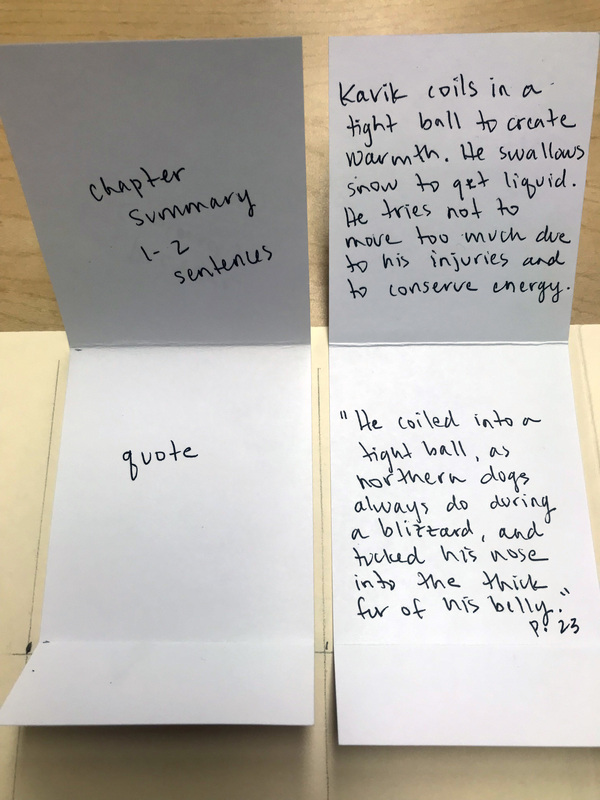 The interior of the matchbook has the chapter summary and supporting quote (optional). The students had been writing summary statements while we were reading the novel, so they had the sentences ready to transfer to the folded cards. I gave them a graphic organizer like this Chapter Summaries Chart to keep in their language arts notebook while we were completing the novel unit. Students glue the back of the matchbook inside the grid lines in the manila folder. We had trouble with some of the matchbooks falling off if students were not heavy enough with the glue stick, so you may want to use Elmer’s liquid glue. Remind students not to over-squeeze the Elmer’s glue, or you will end up with the opposite problem. Once all matchbooks were attached to the inside the folder, students designed the outside to look like our book cover. I encouraged students to complete all cards before gluing to the interior of the folder. Some grid spaces were not big enough for cards due to the notches for the file folder tab. The cards need to be in numerical or chapter order, so the students may want to place all cards before gluing. I let students decide if they wanted to place the cards in order by going all the way across horizontally and then starting a new line or stacking the cards in columns from left to right. If cards are glued to the interior before designing the outside, the surface is bumpy. 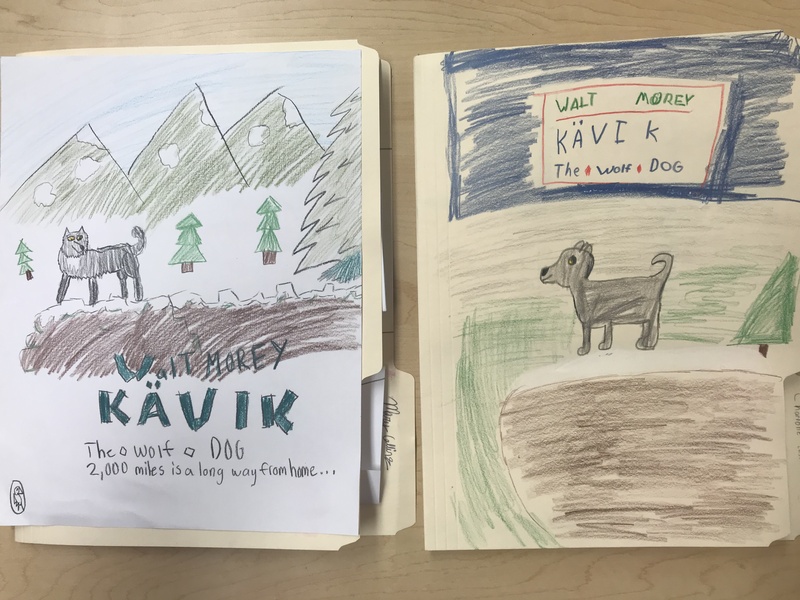 I had some students create the book cover style illustration on a separate piece of paper and attach it to the outside of the file folder. To see my complete novel unit for Kavik the Wolf Dog, CLICK HERE. To check out more creative writing activities to go with any novel study, CLICK HERE. I got inspiration for this activity from THIS BLOG POST.